Lutron Designer - Technical Comfort, Inc. When you decide to add Lutron lighting and shading systems to your home or the home of one of your clients, you not only need to choose the right products, but also the right designer. That’s because the components themselves need to work together in concert to create the moods, scenes, and atmosphere that fit your lifestyle. Your Lutron Designer is responsible for all of that. 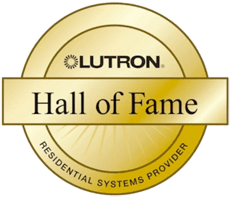 Lutron designer, programmer, and installer Rick Wlodyga has led our company, Technical Comfort, to become a two-time winner of Lutron Excellence Awards and has been a Lutron Diamond Dealer since 2010. We’ve won these awards because our number one goal is customer satisfaction and providing exceptional service and responsiveness to each and every client. We get to know our clients and how they live in their homes, which allows us to design, program and customize each system to the particular needs and desires of each individual client. But what makes Technical Comfort the right choice to design your Lutron system? The answer lies in Rick’s experience not only as a designer, programmer and installer, but also as a Lutron owner. Our company’s offices and Rick’s home are filled with Lutron components that control absolutely everything. Rick and his team have lived with Lutron every day for the past 14 years, and know what works best for any situation and for every Lutron component. It’s only this kind of first-hand experience gained by living with Lutron that gives a Lutron designer the knowledge he needs to design a system for your home. What Goes Into a Lutron Design? Your Lutron design begins with an understanding of how you live your life. We listen intently not only to what you say, but what you mean. We learn not only what you do, but also who you are. Then we figure out unique ways to help you not only have what you want, but to have what you dream. Does anyone in your family often come home late at night? Then we’ll make sure the home is lit exactly as you wish it to be to create a safe and beautiful entrance to your home, no matter the time. Are your small children afraid of the dark? Then we will set up your “Good night” button to leave the hall lights on just in case they wake up at night and need to see mommy or daddy. Does your dog often need to go out at night? Then let’s set up a custom “Take the Dog Out” button that lights your path through your home to the backyard. A single press of the same button turns the lights off again so you can get back to sleep quickly and without worry that you left a light on. Do you like to spend summer evenings on the back porch? One button sets the mood exactly as you wish it to be. If you own multiple properties, you probably don’t want to have to get used to different ways to control each of your homes. We design all your Lutron systems to work consistently so every house feels like home. Would you like your home to be as energy efficient as possible? Lutron’s components give us the tools to customize our creative energy saving solutions for you. Priorities and situations like these, and dozens or hundreds more like them, are what we care about and what makes a Lutron system the right choice for your home. No other system is as flexible and reliable as Lutron, and no other designer is as insightful and experienced as Rick Wlodyga. Technical Comfort has designed Lutron systems for over 400 homes, so we’ve learned a thing or two about how to design a Lutron system properly. So come experience what it’s like to have the home of your dreams, all lit and shaded beautifully by Lutron. You can start by giving us a call.